…You [disciples] will leave me all alone. Yet I am not alone, for my Father is with me. By His very nature, our heavenly Father could not turn away from His only begotten Son, especially at the moment for which God has been preparing him all of his life. Jesus Christ was the crux of history, the one on whose shoulders the salvation of mankind was riding, the one who trusted his Father step by step all the way to this defining moment of His-story. And then God forsook him? That just doesn’t make sense. More importantly, it is not what the Bible says. Hebrews 10:5 and 6 are especially relevant: “Therefore, when Christ came into the world, he said: ‘Sacrifice and offering you did not desire, but a body you prepared for me; with burnt offerings and sin offerings you were not pleased” (See also 10:8 and 13:11). These verses show that in the Hebrew Scriptures, sin offerings, were the best God could do for His people at that time, simply pointed to the coming of the only one who could sacrifice his own body as a once-and-for-all sin offering. Scripture is all about the great truth that by his genetic perfection (God’s choice via his virgin birth) and behavioral perfection (his choice to always obey God), Jesus, the Lamb of God, was the perfect offering (sacrifice) for all the sin (nature) and sins (behavior) of mankind. The righteousness Jesus “earned” paid the price for all men’s sins and made possible the “gift” of righteousness (Rom. 5:17 KJV) to all who believe in his work on their behalf. It is significant that the First Adam did sin—royally—and yet God did not forsake him. Cain sinned, and God did not forsake him either. The truth is that God has never forsaken His people because of their sin, so why would He do so with His own Son? There is no way (and no verse saying) that God forsook the Last Adam [see Segment 10, part 1, “One Day With The Creator“] after he had walked a perfect walk all the way to the Cross. Think about the beating and torture that Jesus endured. And think about the fact that spikes were pounded into his hands and feet, each of which contains many bones. How was it possible that not one bone was broken? We assert that it was as if God drew a line in the sand and said, “No more than that!” That prophetic promise must have given Jesus assurance as he went through his horrible ordeal. He knew that his Father was right there with him, and God’s keeping that promise was a forerunner of His greater promise to raise Jesus from the dead. If God forsook Jesus on the Cross because he became sin, what will God do when you and I sin? He would have to turn His face away from our sin, and from us, but that is not how our heavenly Father is, nor what He does. When Jesus was arrested, and Peter pulled out his knife to fight the soldiers, what did Jesus say? “Do you think I cannot call on my Father, and he will at once put at my disposal more than twelve legions of angels?” (Matt. 26:53). It appears that Jesus and His Father were quite close, and that Jesus was counting on God to be there for him with whatever he needed. And so, when we read Matthew 27:46—”…why have you forsaken me?”—we must ask ourselves if we really understand what Jesus said and why. 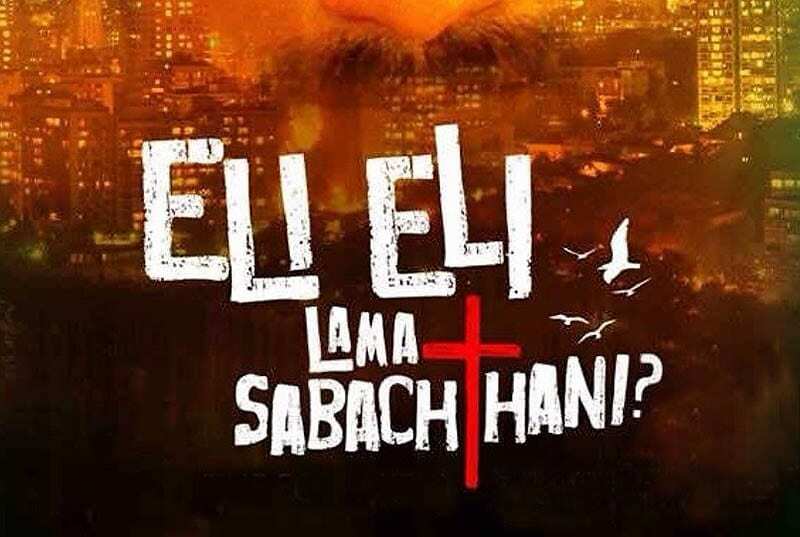 Without going into depth about the Aramaic words Eloi, Eloi, lama sabachthani, suffice it to say that Eloi means “My God,” lama means “why,” and the root word shabak, while usually translated “forsake,” is also translated “kept” or “reserved.” Thus, the context is important to determine its meaning. Keep that in mind that Jesus repeatedly referred to Hebrew Scripture prophecies to substantiate that he was the Messiah to Israel, and, if you want to follow along in your own Bible, look at Psalm 22. As you picture the scene at Golgotha, remember that Jesus had been beaten and tortured for about 40 hours prior to his death, and that he was covered with blood. Besides Mary, Jesus’ mother, and others close to him, no doubt many of those gathered around were people Jesus had healed, people who believed, or at least hoped, that he was the promised Messiah. What did that horrible sight on the center cross do? It assaulted their faith. Don’t you think that what they saw happening to their hero might have caused them to doubt whether or not all Jesus had said was true? And so, as his manner was, Jesus Christ reached for their hearts with God’s Word. He did so by quoting a section that they all knew, one that vividly sets forth that which was vividly being enacted right in front of their eyes. With some of his last breaths, he spoke the Word. He spoke to comfort those who believed on him, and at the same time gave those who did not believe, including those who were crucifying him, one more opportunity to believe that he was who he said he was—the Son of God, the Messiah. Have you ever heard of the twenty-third Psalm—maybe even before you were a Christian? Did you ever memorize a part, or all, of it? Would you agree that the twenty-third Psalm is one of the most famous sections of the Bible? You know, “The LORD is my shepherd, I shall not want.” And we’re in the twenty-first century. What about 28 A.D.—in Jerusalem? Do you think the Israelites, to whom the Psalms were written, might have known it? Have you ever wondered why Psalm 23 is so well known, but not Psalm 79, for example, or 32 or 57? One of the reasons is that Psalms 22, 23 and 24 form what you might call a “Messianic Trilogy,” one that virtually every Israelite knew by heart. Keep that in mind as we look at Psalm 22. Have you ever been listening to the radio and heard even one line from an old song that is one of your favorites? Doesn’t the whole song run through your head? Sure, because it is in your memory. Maybe you even start singing it. Well, Jesus quoted the beginning and the ending of one of the most famous, most well-known, and most memorized sections of all of the Hebrew Scriptures, one that vividly set forth what was taking place right in front of their eyes. No doubt for many of them who had ears to hear, the verses we are about to read flashed through their minds. As we read on, we will see that these are basically rhetorical questions, because after verse 18 the theme of the psalm changes radically from death unto life. But to many standing around at the scene, their attention riveted by the horror of it all, it certainly appeared as if God had forsaken this man who had claimed to be His Son. 2 Oh my God, I cry out by day, but you do not answer, by night, and am not silent. 4 In you our fathers put their trust; they trusted and you delivered them. 5 They cried to you and were saved; in you they trusted and were not disappointed. To whom did Jesus come? Israel. To whom was this Psalm written? Israel. Look how he is reminding them of their spiritual heritage, which included the Messiah. But I am a worm and not a man, scorned by men and despised by the people. The word “worm” here is very interesting; it is the Hebrew word tola, which is not the ordinary word for worm. Rather, this was a worm from which crimson or scarlet dye was obtained. Why is this word used? Because Jesus was covered with blood, and was the color of scarlet dye. Didn’t we read something like that in Matthew 27:41–43? Yes, that very prophecy was unfolding right in front of their eyes, and Jesus was trying to call their attention to it. 9 Yet you brought me out of the womb; you made me trust in you even at my mother’s breast. 10 From birth I was cast upon you; from my mother’s womb you have been my God. 11 Do not be far from me, for trouble is near and there is no one to help. Remember? “All of you are going to leave me,” Jesus said. Many bulls surrounded me; strong bulls of Bashan encircle me. “Bashan”? What does that mean? If you look it up you will find that Bashan was the chief cattle-raising area of Israel where the biggest, best, strongest bulls came from. Figuratively, Jesus is referring to the religious “top brass” of Israel. It was the Pharisees who had inspired, cajoled, and manipulated the Romans to pound the nails. As such, they were the ones responsible for Jesus’ death. 13 Roaring lions tearing their prey open their mouths wide against me. 14 I am poured out like water, and all my bones are out of joint. My heart has turned to wax; it has melted away within me. 15 My strength is dried up like a potsherd, and my tongue sticks to the roof of my mouth; you lay me in the dust of death. 16 Dogs have surrounded me; a band of evil men has encircled me, they have pierced my hands and my feet. 17 I can count all my bones; people stare and gloat over me. 18 They divide my garments among them and cast lots for my clothing. When the Romans crucified someone, they formed a cordon of soldiers around the cross to keep the people away. And the Jews referred to uncircumcised people like the Romans as “dogs.” “I can count all my bones.” That’s another figure of speech meaning that in his many beatings and floggings, Jesus’ skin had been flayed to the bone. People spit on him, taunted him, and gloated over him. “They divide my garments among and cast lots for my clothing.” This could not more clearly describe what later happened at Golgotha in fulfillment of this prophecy. And it is at this point that the thrust of Psalm 22 begins to shift from death unto life. 19 But you, O Lord, be not far off; O my Strength, come quickly to help me. 20 Deliver my life from the sword, my precious life from the power of the dogs. 21 Rescue me from the mouth of the lions; save me from the horns of the wild oxen. 22 I will [in the future] declare your name to the brothers; in the congregation I will praise you. 23 You who fear the LORD, praise him. All you descendants of Jacob, honor him! Revere him, all you descendants of Israel! How is the Messiah going to praise God in the future when it is clear that he was to die? Only if God keeps His Word and raises him from the dead. And the next verse indicates that God had not forsaken him and would do just that! For he has not despised or disdained the suffering of the afflicted one; he has not hidden his face from him but has listened to his cry for help. 25 From you comes my praise in the great assembly; before those who fear you I fulfill my vows. 26 The poor will eat and be satisfied; they who seek the LORD will praise him—may your hearts live forever! 29 All the rich of the earth will feast and worship; all who go down to the dust will kneel before him—those who cannot keep themselves alive. 31 They will proclaim his righteousness to a people yet unborn—for he has done it. Jesus Christ knew that, and in the final agonizing moments of his life had the presence of mind and the love for all men, including those who were killing him, to once again hold forth to them the Word of Life. He quoted the very first clause and the very last clause of a section of Scripture that they knew very, very well. With his dying breaths he affirmed one more time that he was who the Word of God said he was—the Messiah, the Son of the living God, the Redeemer of Israel and all who in the future would believe on him. What a man! What a Savior! No, God did not forsake His Son, and He proved it three days and three nights later when He raised him from the dead. What a mighty God we have! Let us walk in Christ’s resurrection power and make known his life to a dying world. Amen.